Quit snickering! 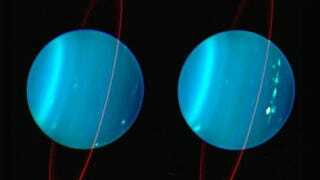 Something on Uranus has erupted and now scientists are all in a tizzy about what and why it might be. The news is exciting for a number of reasons. The simplest being we know very little about Uranus, mostly due to its incredible distance form Earth and because it's, well, frankly one of the more "boring" planets out there. "The reason we care about the clouds on the planet Uranus is that they seem to be seasonally driven," said planetary scientist Heidi B. Hammel over at MSNBC.com. "Uranus spins tipped over on its side, giving rise to extreme changes in sunlight as its seasons progress. The changes are therefore much more dramatic than for other planets. Uranus thus gives us unique insight into the energy balance in a planetary atmosphere."